With Fairtrade, tea producers also receive the Fairtrade Premium of $0.50 for every kilo of tea sold. 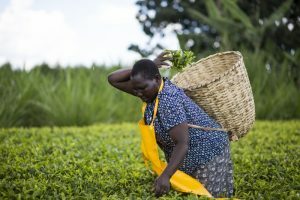 In 2015, tea farmers and estate workers earned more than $6.3m in Premiums, which they invested mainly in social projects, such as education, healthcare, and infrastructure. Teresa Kurgat, 47, tea farmer who has directly benefited from a water tank project that now supplies piped water to her house. Her pipe also supports water access for a local primary school. For example, Maheve Secondary School, 520 students, has benefited from the Fairtrade Premium from Kibena Tea Estate in Tanzania, which has built four classrooms, two laboratories, two staff quarters and two hostels that house 120 students.